Where to find historic homes in the San Jose and Silicon Valley area? Sometimes newcomers to Silicon Valley strongly prefer older homes, such as Victorians, Craftsman, or other distinctive architectural styles, preferably surrounded by homes of the same vintage. Most of the valley is filled with ranch style housing, but there are quite a few neighborhoods which enjoy historic home which exude tons of charm. Where to find them? There are many more scattered throughout San Jose and nearby suburbs, even in places like Cambrian Park or Almaden (away from the old mercury mining area), where it seems all the houses were built from the 1950s to the 1980s. When we see a hundred year old house in this area, it’s very likely that it used to be the house on a large ranch, orchard or farm. Palo Alto enjoys some of the most beautiful, gracious older houses in Silicon Valley, particularly the Professorville and Old Palo Alto areas, but others too. Drive the neighborhoods between Stanford University (El Camino Real) and 101 and you’ll find lots of historic homes to love! The challenge is affordability, as these are the most expensive historic homes in the region. There are many more lovely older homes throughout Santa Clara and San Mateo Counties and nearby. If you enjoy these classic beauties, watch for a series of spring home tours which become available beginning in around March each year. Most of them will cost a few dollars, with proceeds going to a worthy local charity. If you’re interested in purchasing an historic property, visit my “search by map” page and enter a “built before” year and then scroll around the valley to see what is available. Where are the Silicon Valley luxury homes? Where are the more upscale Silicon Valley neighborhoods? If you are relocating to Silicon Valley and wish to choose an upscale or luxury neighborhood, where should you begin looking? Where are the very best areas in or near San Jose? Most of the more expensive parts of Silicon Valley are along the “west valley” areas, and these all enjoy excellent public schools. If you were to look at a topographical map, they would be the cities, towns and neighborhoods close to the coastal foothills (also known as the Santa Cruz Mountains). Or if you looked at a road map, most of them would be on the west side of Highway 85. Unless otherwise noted, the districts, cities or towns are all in Santa Clara County. These “west valley communities” are listed from southernmost to northernmost, extending from southwestern San Jose up into the San Francisco Peninsula. These are not the only places to find high end real estate in the South Bay area, though – it’s just that most of them are located along the west valley corridor. Part of the Alum Rock neighborhood near the old San Jose Country Club (also on the east side). What Type of Home Can You Get for $1,000,000 in Silicon Valley? What’s Selling in Los Gatos Now? How’s the Market? Got swimmers? Our sub tropical climate in Silicon Valley makes swimming a popular sport, so if you relocate to the “Valley of Heart’s Delight” you may find an increased desire for jumping into a pool. Perhaps swimming is already important to you or to your family.Several community centers have excellent swimming facilities, including the Cambrian Park Community Center in San Jose (at Union & Camden Avenues, approximately), the Y and several provate clubs. If you are looking to live in a neighborhood with a swim club and cabana, you will find many options in the San Jose – Santa Clara County region. The city of Santa Clara probably has more pools, cabanas and swim teams than any other part of the south bay. There are plenty in San Jose, too, though, including in Los Gatos, Cambrian Park and Almaden Valley. There are different leagues, not all of them with easily findable websites. Relocation can be challenging but if you know what features you want to find when you get to Silicon Valley, I can help you to locate them, whether it’s a place to swim or virtually anything else. Silicon Valley’s rush hour traffic can begin as early as 6:45 or 7 am and last until 9 or 9:30am most workdays. The evening commute begins to get congested around 3 or 3:30pm with a knot of traffic in place by 5pm and lasting until around 6:30 or 7pm on some roads. Looking for a reverse commute? Many commuters do precisely that! If you work in Scotts Valley (just “over the hill” in Santa Cruz County), living in Los Gatos, Campbell, Cambrian Park or West San Jose will be a reverse commute for you. You’ll be going against the flow of traffic and your commute will be immensely easier. Ditto that if you work in the south San Jose or Edendale region and begin your commute in Almaden Valley. Once you get to 85, it will be a breeze! Work in Gilroy? Living in Blossom Valley or Almaden, you can engineer a reverse commute on the back roads or take Santa Teresa Blvd going south. Most employees and workers try to carpool, take light rail, or otherwise beat the rush by using tricks of timing or alternate routes to avoid spending twice as much time on the road as necessary. Many companies have flexible hours – it’s worth investigating to see if you can shorten the length of your time in the car! Relocation to Silicon Valley can be a bit of a shock to people in terms of the traffic and commute times if they are not accostomed to suburban living (which is most of the valley). Typical commute times are about 30 minutes, though some people have longer or shorter commutes, of course. Traffic moves toward downtown San Jose primarily along Highways 87, 680 and 280 and toward the Cupertino – Sunnyvale – Mountain View areas along Highway 85 (and 280). Bringing traffic in from the south county is 101. 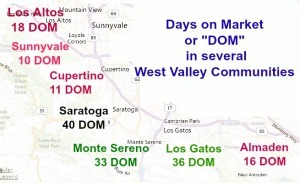 Other roads getting a lot of use too are 17 and 880 (same road, different stretches), San Tomas Expressway, Montague Expressway, Lawrence Expressway, Santa Teresa Boulevard, Saratoga-Sunnyvale Road, Stevens Creek Blvd. and Almaden Expressway.